On his kine he borrows yet. At his heart is his daughter’s wedding. -- Rudyard Kipling, "The Masque of Plenty"
As the world transitions away from the Millennium Development Goals (MDGs) for 2015 to meeting the Sustainable Development Goals (SDGs) by 2030, help for small farmers will become key to the stating aims of ending poverty and hunger and promoting sustainable development. In India, small and marginal farmers -- those who work on less than two hectares (five acres) of land -- constitute 80% of all farm households, 50% of rural households and 36% of the total of all households. Sadly, the plight of these farmers is very distressing. Agricultural productivity levels have been stagnant for the past ten to fifteen years. An estimated 70% of the country’s arable land is prone to drought, 12% to floods, and 8% to cyclones. India’s top policy think tank, NITI Aayog, recently found that the agricultural sector is 28 years behind in its expected development. According to the 70th round of the National Sample Survey (NSS) report "Situation of Agricultural Households in India", 90% of India’s farmers have less than two hectares of land. The survey says the average farm household makes less than Rs 6,500 a month from all sources of income. These farmers are only kept afloat by government financial and by the periodic forgiveness of farm loans. Economic reforms and the opening of Indian agriculture to the global market over the past two decades have made small farmers vulnerable to unusual changes and fluctuations. The small farmers must now compete with the larger industrial farms, which are well-endowed with capital, modern irrigation and supplementary businesses to buffer them against any adverse market shocks. Small-holding farmers are now faced with what has been called a ‘scissors crisis’, which is driven by rising costs without a commensurate increase in output value. MS Swaminathan, who pioneered the Green Revolutions, and other nutrition experts are calling for a dramatic shift in the approach to agriculture. They argue that, instead of industrial-scale, high-tech agriculture, farming should become closer to nature and involve intelligent plant breeding and a return to old crop varieties. “Formerly, the farmers were depending on 200 to 300 crops for food and health security,” says Swaminathan, “but gradually we have come to the stage of four or five important crops, wheat, corn, rice and soybean.” “The Green Revolution did not eliminate hunger and malnutrition.” Today, Swaminathan speaks of an ‘evergreen revolution‘, which combines the best of both high-tech and environmentally sound agricultural practices. Vandana Shiva, a prominent opponent of modern agricultural engineering, is calling for a return to diversity in agriculture. “Most of our traditional crops are full of nutrients,” she explains. Farmers who have made the switch to modern corporatised agriculture, she explains, give up their traditional seed only to be forced to buy the commercial varieties, which often come with license fees in perpetuity. She recommends field crop-rotation, and the fostering of vegetable and fruit gardens and small family farms primarily geared toward nutrition instead of maximised profit. Crop rotation techniques ensure that no single botanical crop family has predominance in the rotation, hence pests do not build up as they tend to be specific to certain crop families. Small farmers also need to revive some traditional farming practices that have been lost in the rush of new technology. Land levelling, mulching, and crop diversification are all practices that improve soil health and reduce the excessive spend on fertilisers and chemicals. These inexpensive practices help to preserve soil nutrients, prevent erosion, suppress weeds, and increase fertility. Crop residues that are generally burnt in the field—which contributes to local air pollution—can be used productively as mulch. Also, there would be no need for expensive diesel gensets for tube wells if farmers adopted proven irrigation technologies, such as the drip-and-sprinkle method. The National Sample Survey Office (NSSO) makes another hard revelation. During the last decade, the bloated debt of Indian agricultural households has increased almost 400%, while their undersized monthly income has plummeted by 300%. Unsurprisingly then, the number of heavily indebted households increased steeply during this period. 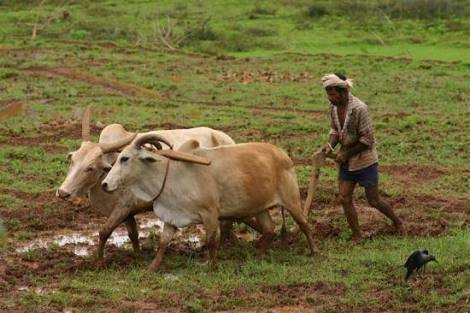 Most farmers have become victims of the endemic phenomenon of a downward slide on the social ladder, by which the farmer became a sharecropper, then a peasant without land, then an agricultural labourer, and then is forced off the land. Social mobility for farmers is becoming an unrealisable dream. In a post on his Gates Note blog, Bill Gates said that it was critical to protect small farmers in the world’s poorest countries because they produce a large and growing share of the world’s food supply and because they face the greatest risks from climate change. “For the world’s poorest farmers, life is a high-wire act—without safety nets. They don’t have access to improved seeds, fertilizer, irrigation systems, and other beneficial technologies, as farmers in rich countries do,” Gates writes. Indians believe in “Uttam—Kheti, Madhyam—Vyapar, Neech—Naukri.” as the country’s first Prime Minister, Jawaharlal Nehru, said in 1947, “Everything can wait, but not agriculture.” However, what India is witnessing today is exactly the reverse. While all the other sectors of the economy are surging ahead, agriculture is the only one which is in decline. Within this self-perpetuating cycle of rural misery, wrapping a noose around the neck is the all-too-easy exit for an increasing number of smallholding farmers. While these deaths might bring about a personal escape for some, they leave behind crippling emotional, financial and physical burdens for society.